Quality Systems Inc. (QSII) is a software company focused in the development and marketing of practice management for medical and dental group practices and hospitals throughout the US. 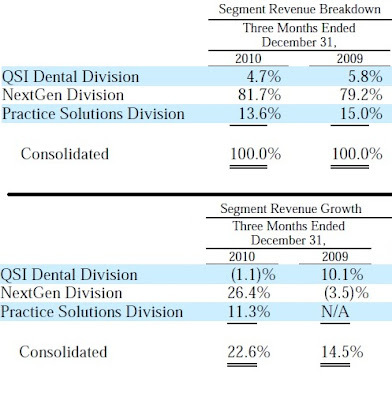 The company founded in 1974, initially provided information systems to dental group practices and later expanded its focus to include medical practices in the mid 90’s through acquisition of two companies. This formed the basis for their highly successful NextGen product suites, which handle Medical Practice Management (MPM), Electronic Health Records (EHR), Health Information Exchange (HIE), Revenue Cycle Management (RCM), Electronic Data Interchange (EDI), and the associated connectivity services. Along with the hardware, the company provides software, connectivity, training, and other services to medical and dental group practitioners. The software creates electronic medical records, helps with appointments, billing, referrals, and insurance claims. The RCM aspect of the software helps doctors manage cash flow and collections. The HIE allows to exchange electronic medical records with other healthcare providers. 1. Medical: The NextGen Healthcare suite serves from mid to large size group practices and the small rural hospital industry. The product provides EHR, HIE, and financial solutions for hospitals, health systems, physician practices, and other healthcare organizations. 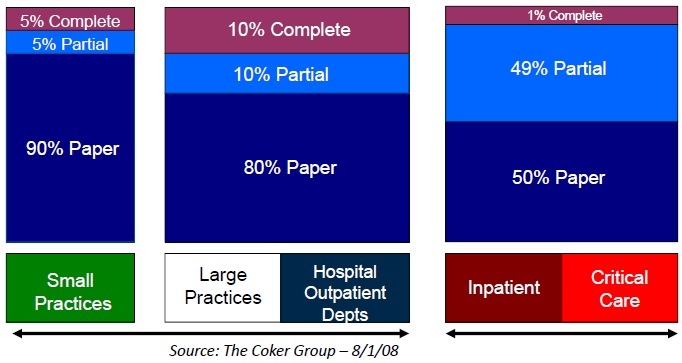 Practices can opt to run the in-house ambulatory product suite (NextGen ambulatory EHR and NextGen practice management) or select the data hosting option with low upfront costs and predictable annualized expenses. NextGen also has product suites for inpatient as well as Community Connect areas (NextGen HIE, NextGen patient portal, and NextGen health quality measures). Dental Practice Management (DPM) solutions – insurance processing and appointment scheduling, patient portal for online services, billing/accounts receivable management, centralized data management. Electronic Dental Record (EDR) services – graphical tooth charting, treatment planning, digital radiography, x-ray and imaging, and voice activated periodontal charting. NextDDS Services (online software-as-a-service) – patient and multi-specialty doctor management, centralized data management, clinical management, appointment scheduling, and insurance management. 3. Practice Solutions – The RCM and EDI solutions allow medical practices to outsource their billing and collection. 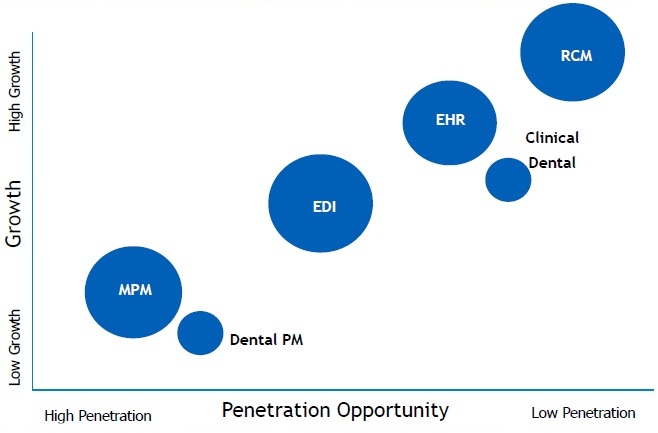 The company’s growth opportunity stems from the demands of the EHR marketplace, QSI’s P3 Connectivity Suite (Provider-Patient-Payor), and practice management solutons. Opus – clinical information systems provider to the small hospital inpatient market. The numbers demonstrate very strong growth and profit records for the NextGen unit, above average figures for the QSI Dental Division, and average numbers for the Practice Solutions Division. 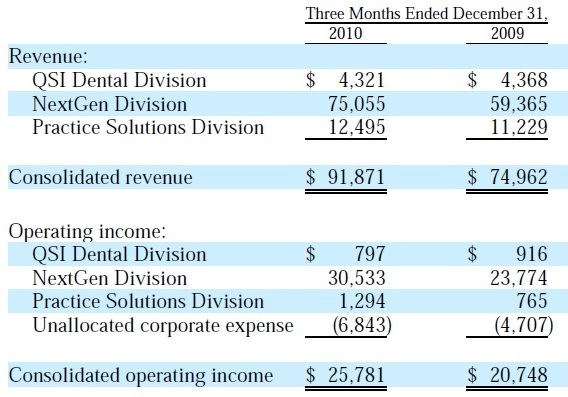 The profit margin numbers for Practice Solutions Division need to be tracked vigilantly as that could potentially force overall numbers down should the negative yoy trend continue. The adoption rates are expected to accelerate in the 2011-2015 timeframe as a result of government incentives for Healthcare Information Technology (HIT) in the order of $60B. The government approach is considered “carrot and stick” – the upfront incentives serve good only if “meaningful use” is established by 2015 or else penalties kick in. QSI is expected to directly profit as medical practices scramble to fall in line with this incentive. 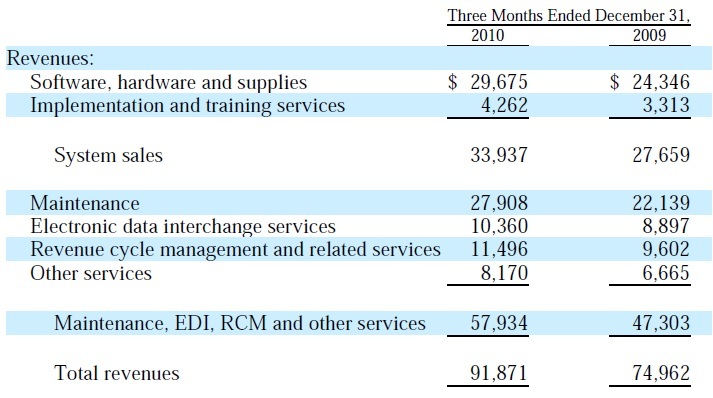 The revenue growth in maintenance is remarkable, yet it is a line item to track keenly going forward – as the software gets simpler, certain services such as follow on training and implementation will have less impact leaving other services like hosting to pick up the slack in order to keep the overall growth steady. The software industry is moving to a subscription-based delivery and pricing model. 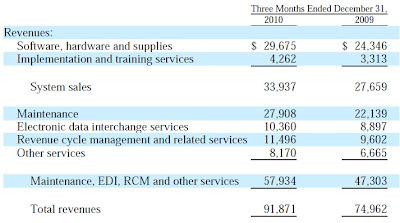 QSI adopted a subscription based software-as-a-service (SaaS) delivery model with monthly subscription pricing in April 2009. The plan is to apply this model as a seeding strategy in small practices – in the absence of upfront cost they pose little risk. Although a majority of their current paying customers buys licenses to their software and subscribes for maintenance, in time a greater part of these customers will reach for the new subscription model. Also new customers, irrespective of size, will prefer the subscription model once the adoption of that variety accelerates across corporate America. 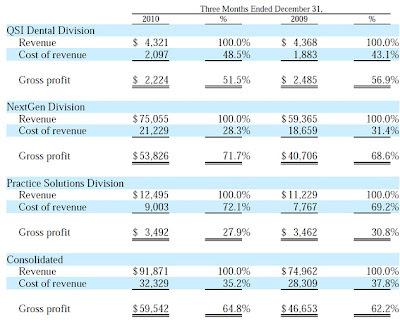 This will have an initial dampening on the company’s revenue, as revenue per customer would decrease substantially. On the other hand, the maintenance and number of customers should pick up pace as customers realize the benefits of this new model – very low hardware and training costs. Nevertheless, this is something to keep tab on, going forward. Despite the recessionary environment, the company managed an almost 19% revenue growth. While this is far below the revenue growth level achieved in 2009, considering the business environment, it is laudable. The net profit margin presented a downward trend while earnings growth showed a big drop-off last year. This needs to be monitored for if this trend continues, it could be an indication of QSI’s difficulty in keeping prices up for its products and/or keeping costs down. 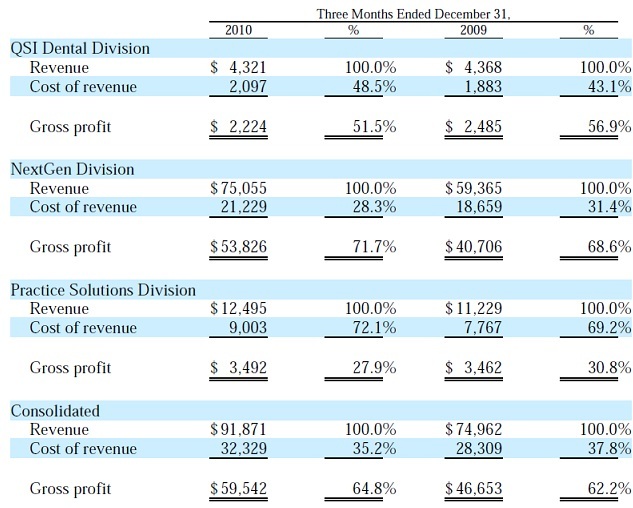 QSII scores 7.5/10 on its ability to beat inflation: Return on Equity, Net Profit Margin, Free Cash Flow are all almost perfect. PEG ratio, a measure of valuation is however very rich at 1.86. Corporate Abuse rating is 10/10 as their executive compensation is commendable: The CEO makes around $550K, around 20 times the average worker – considering the rampant abuse regarding executive compensation in corporate America, this is a very fine number – Mr. Pat Cline, President of the company’s NexGen division makes around 50% more than the CEO which is rare. Income generation and liquidity measure is above average at 7.3/10: QSI pays a decent 1.9% dividend. The stock is also optionable but liquidity is slightly low with the average daily volume just below 250K. Volatility ranking is perfect at 10/10: the company has no debt, Beta is average, and grew earnings steadily in the last 5 years. Capacity to increase dividends scored 7.7/10, which is above average: Quality System’s payout ratio is above average at 67 – company has limited ability to grow dividends unless earnings growth is sustained. The company has average 5-year average dividend growth at an annualized rate of 6.52%. Earnings however showed a very good growth rate of 14.6% in the last 5 years. 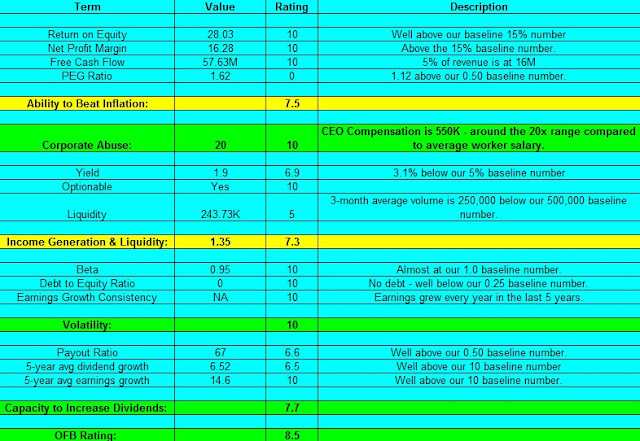 The overall quantitative rating or the ‘OFB Factor’ came in at 8.5/10, which is well above average. 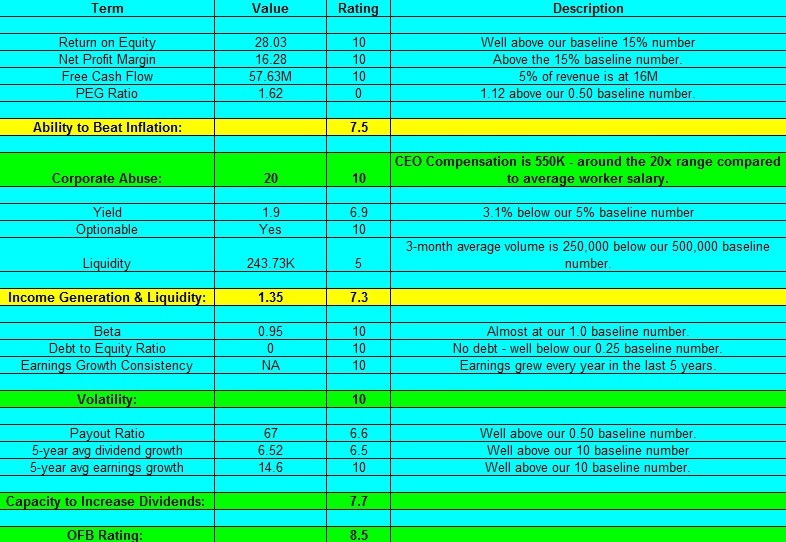 Quality Systems has an enterprise value of $2.38B and a forward PE of 31.18. Its revenue growth slowed last year but is still very healthy in the high teens range. Going forward, the company is expected to grow revenue in the high 20% range for the next two years and earnings per share is expected to keep pace. While the growth rate projections are already impressive, the real kicker is the fact QSI may have underestimated the effect of massive government incentives to its bottom line. Quality Systems has a PEG ratio of 2.21, which indicates that the valuation is high. Our quantitative analysis showed the company as having a ‘Very Good’ rating. Although most of our other checks showed green lights, the valuation is high. We recommend adding Quality Systems to the watch list and consider purchase when the share price gets cheaper.